Replace your faulty or old front performance-robbing catalytic converter with the all new aFe Power Race Pipe for the 2006-2014 MINI Cooper S (R56) L4-1.6L turbo N14/N18. Our Twisted Steel Race Pipe is designed for optimum flow creating a performance gain of +10 horsepower and +9 ft. lbs. of torque. Constructed from 2-1/2" stainless steel tubing and 6" flex tube with an internal interlock liner this system adds an aggressive sound and increase throttle response that will keep you coming back for more. 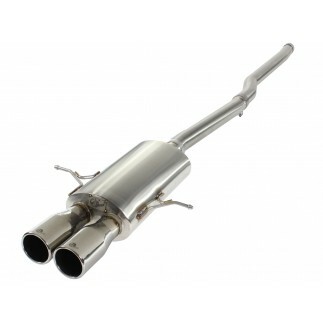 A 2-1/2" 304 stainless steel tubing, is used to increase exhaust velocity and increase usable torque. This means a more aggressive throttle response and increased passing power. This unique race pipe uses a heavy duty 6" flex tube with an internal interlock liner for added strength and durability. This race pipe is constructed of durable mandrel bent brushed 304 stainless steel tubing for maximum performance, corrosion resistance and strength eliminating cracking.